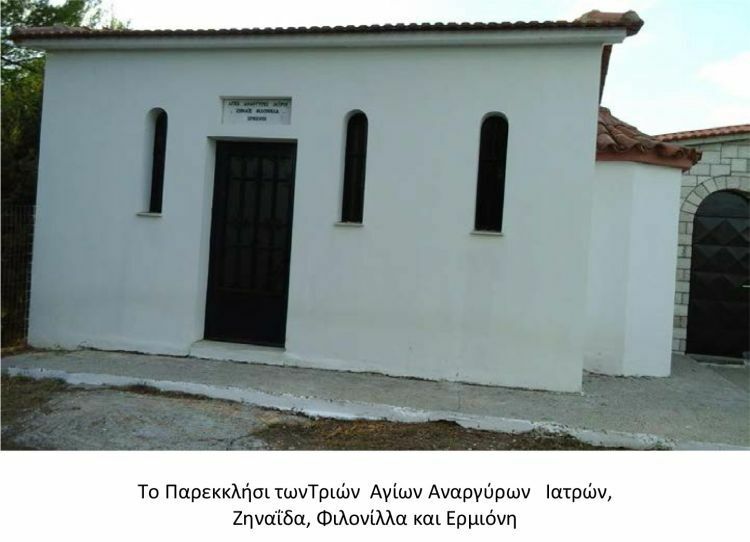 Next to the entrance of the Monastery of Saint Kosmas the Aitolos in Mega Dendron of the town of Thermo in the Trichonida Province, Abbess Euthymia not long ago built a chapel dedicated to the Three Holy Unmercenary Female Physicians Zenaida, Philonella and Hermione. 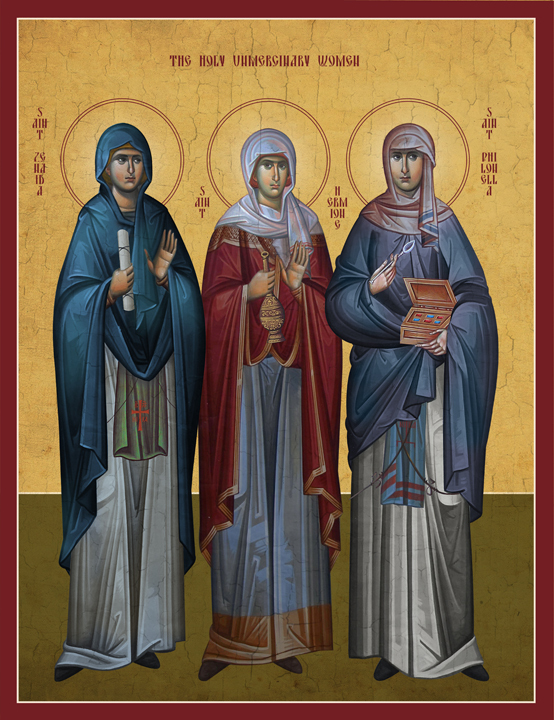 These three female martyrs are noted for their healing abilities in their lifetimes. 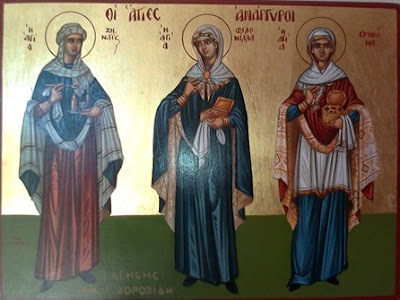 Zenaida and Philonella were sisters and are commemorated together on October 11th, while Hermione was the daughter of the Apostle Philip and commemorated on September 4th. The memory of these three Female Unmercenary Saints is celebrated in their chapel on October 11th. Interestingly, this tradition was founded by three women - the first in the long series of "unmercenary physicians." So far as we know, the first of these great "unmercenary physicians" were women. The sisters, Zenaida and Philonella were born in the district of Tarsus early in the first century. They were cousins of Apostle Paul and sisters of the first Christian bishop of Tarsus, Jason. They were born into a highly educated Jewish family. Both sisters entered the famous school at Tarsus to study philosophy but were especially attracted to the lectures of the medical theorists. They were converted to Christianity by their brother Jason and were very much attracted by the love and compassion of Christ. After their baptism, the two gave themselves over more fully to the study of medicine and began to apply Christian principles and ideas to medical philosophy. Orthodox Christianity taught that salvation is a healing process. The two sisters were deeply impressed with the realization that Christ tied the healing of the whole person, spiritual and physical with the presence of the Heavenly Kingdom. Philonella was a patient and careful scholar who was determined to separate medicine from ideas of magic and astrology. She was also much interested in women's health problems and became a pioneer of gynecology. Zenaida, who was more of a contemplative, was keenly interested in the suffering of children and worked to develop pediatric care. Toward the end of her life, Zenaida became interested in what we would now call "psychiatric medicine." Many of those who came to their hospital suffered from severe depression and other psychiatric illnesses. Zenaida had the wisdom to recognize these as actual illnesses and concerned herself with their causes and cure. In the Orthodox Church, the two sisters are known as "the friends of peace." The other pioneer of the holy unmercenary tradition was Hermione, a daughter of Philip the Deacon (Acts chapter 6). She was born in Caesarea of Palestine early in the first century. Joined by her sister Eukhidia, Saint Hermione bought a house and founded a medical clinic devoted to the treatment of the poor and the homeless. Rooms were added for poor travelers who were ill. In this way, Hermione started the tradition of Christian hospital-hostels or "xenodochia", which would become so much a part of the function of the early Orthodox Christian dioceses.